Carl returns to hometown Los Angeles to perform at Zebulon. Some pieces from his new album on Unseen Worlds and some even newer material as well. Also on the bill Booker Stardrum + Celia Hollander. Carl’s first performance in LA since 2017! Posted in 2019-03 Performances, Archives. Tagged NOT-RM. In keeping with his migratory patterns, Carl returns to Brooklyn in March to perform, this time at MURMRR, the event space inside the historic Union Temple of Brooklyn, Also on the bill, the endlessly engaging percussionist Eli Keszler. Carl returns to the nation’s capitol for a performance at Rhizome DC, a nonprofit community arts space located in the Takoma neighborhood of Washington DC. Carl’s last performance in DC was at the New Music America festival – in 1983!! 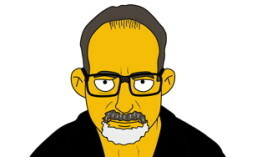 Monday March 18 2019 open 8:30PM start 9:00PM Carl’s Baltimore debut could not be at a finer place, i.e. The Red Room under the support of the High Zero Foundation. As they themselves describe, the Red Room venue is THE laboratory for paracultural revolution of the Mid-Atlantic Region. It is a space run entirely by volunteers, intent on expanding their own and society’s cultural horizons—“expanding the definition of expanding the definition.” Carl will perform a solo set and for the second part of the evening will hopefully be joined by the special guest Japanese voice artist AMI. Carl joins the fun at this year’s Big Ears For this performance at the Knoxville Museum of Art’s Contemporary Gallery, he will perform his multi-channel composition FUJIKEN, made from field recordings and cassettes during his travels throughout Southeast Asia. The performance will take place utilizing the Roedelius Cells multi-channel sound system specially installed in the gallery. Carl Stone + Akaihirume make their Taiwan debut as a duo. as the Birds Singing in the Universe Tour kicks off in Taipei. Included in the evening will be a collaboration with the award-winning Arts Blooming Ensemble. Posted in 2019-01 Performances, Archives. 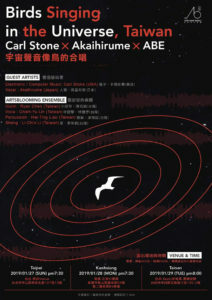 The Birds Singing in the Universe Tour continues as Carl Stone + Akaihirume come to the Kaohsiung Experimental Theater. Included in the evening will be a collaboration with the award-winning Arts Blooming Ensemble. The Birds Singing in the Universe Tour concludes as Carl Stone + Akaihirume travel to Tainan City and perform at music venue SEETY. Included in the evening will be a collaboration with the award-winning Arts Blooming Ensemble.